Why go round when you can go oval? The round diamond is still king, but the less conventional oval shape diamond is an increasingly popular -- and regal -- choice for diamond engagement rings. It has been around for centuries, though in recent years, celebrities like Blake Lively and Katie Holmes have re-popularized the oval shape with their high-profile engagements. The origins of this fine jewelry mainstay are difficult to pinpoint, but from royalty to celebrity and everything in between, there are plenty of traditions and meanings associated with it. When you choose an oval shape, you get the added benefit of stretching your dollar. That's because a longer, slimmer diamond will look larger than a round diamond with the exact same number of carats and facets. In the 1950's and 1960's, frugal families opted for the oval for this exact reason; several high-end jewelers even capitalized on this trend by offering rings only in the oval shape. Rather than splurge on a giant round diamond, husbands-to-be asked their jewelers to chip away at odd-sized diamonds until the characteristic round edges emerged. In many cases, that meant cutting away impurities and emphasizing the facets, rather than the symmetry, of the gem. Longer diamonds work much like vertical stripes: they flatter the form by elongating whatever body part is wearing them. In the case of rings, an oval diamond shape will actually draw the eye away from the hand and toward the fingertips. That's good news for brides with shorter fingers, but it's extra flattering on those who are already blessed with long, graceful fingers. Pianists and ballerinas are especially likely to choose this shape, because it extends the hands and leaves room for movement between fingers. While largely preferred for their slimming effect, oval-shaped diamonds were once favored because of their ties to nobility and royalty. In the seventeenth and eighteenth centuries, this was particularly significant. The shapes on family crests often dictated the jewelry choices that couples made. In fact, as recently as 2011, Prince William and Kate Middleton had their own crests crafted for their new family and created jewelry that merged her inherited ring with their newfound, acorn-dominated insignia. Whatever your reason for opting for oval, you're in good company. 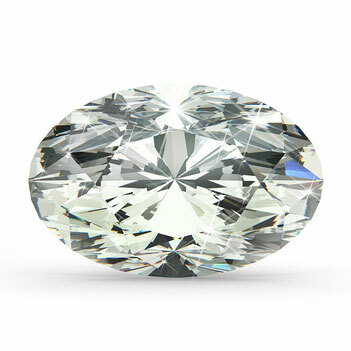 The oval shape diamond is an impressive and stately option for contemporary and classic brides alike.